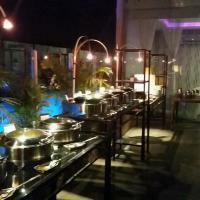 Decent Buffet experience with above average Ambience ! The first thing that strikes about this place is a different kind of ambience as the Kebab unlimited restaurant is located on the rooftop of HHI. To begin with in starters they now serve 3 veg and 2 non veg starters. 2. 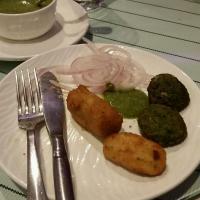 Methi Tikki – 5/5, this was the most delicious of all veg and non veg starters and had a unique taste and texture. 3. Corn stuffed starter – 2/5, this wasn’t good at all and was pretty ordinary, surprised that it was even kept as a starter in the first place. 1. 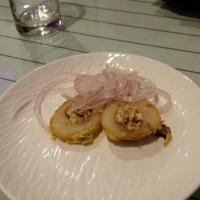 Fish Tikki – 3/5, this was an OK item though my Daughter loved it. 2. Chicken Tikka – 4/5, this was roasted fine but the only downside was the marinade was not consistent on all of the chicken and was very lightly spiced to the point that I had to specifically ask them to put some more spice which they gladly obliged in the next helping. In a nutshell the starters were above average and we would have enjoyed more if the corn starter was good as it took just one starter out of the picture. 1.Khumb Nazakat (Mushroom) – 5/5. This was the best gravy of all the items and was really well prepared. 2. 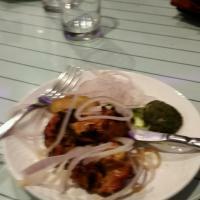 Chicken Hyderabadi – 3.5/5 – Chicken was tender and this was prepared in green gravy. 4. Fish gravy – 3.5/5 – This was alright and the gravy went fine with Biryani. 5. Daal Tadka – 3/5 – This was OK, nothing special about it. 7. Breads – 4.5/5 – Butter Naan was well prepared and lachha paratha was awesome. 8. Mocktails – 4/5 – Lichi mocktail was good and the strawberry one was OK.
Service – 3.5/5 – Overall it was courteous though on more than a couple of occasions I had to remind them about my starters order and had to ask for their attention while the restaurant was only half occupied at that time. To sum up, the experience was a mixed bag and above average but with a little more attention to the preparations it could have been much better.